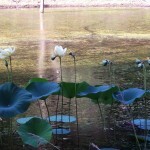 This past weekend (June 28th) my husband and I took a short trip to Buescher State Park for a relaxing camping trip. We had never been there, but on our quest to visit every Texas state park… it was on the list. We left friday morning and took I-10 to Columbus and then 71 to Smithville. It was a pretty direct and easy route from Houston (where we currently live). The trip only took a little less than 2 hours. Once we arrived, the Headquarters where we would check-in was locked and empty and a sign on the door informed us that they were “out to lunch” and would return at 1pm. So we headed into the park and scoped out a campsite. We had reservations in the Oak Haven area, which is nice but most of the sites have rather small driveways. We did however find a perfect site with a long drive and very secluded. It also had virtually the only view of the lake (a very small view, but a view nonetheless). We pulled in and began setting up our Pop-up camper. After set up we proceeded back to HQ and checked in. It was here that we were informed that we had picked “the best” site. Hooray for us!! 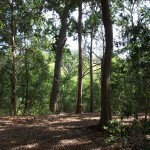 Oak Haven campground is very wooded and has lots of shade in almost all of the sites. It also has 3 small cabins with half wrap porches. The cabins all have views of the lake and come with AC. In the middle of the camping loop there are restrooms with showers. These restrooms were kept clean the entire time we were there. There are 2 shower stalls in each of the bathrooms. One is equipped for handicap, therefore it was much larger. It had a shower curtain, a fold down bench in the shower, and a separate dressing area. Shower 2 was a little skinnier but still plenty of room. It also had a separate dressing area with a built in bench. I love the separate dressing areas because it allows you to keep most of your stuff dry. 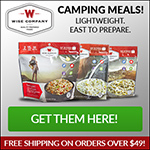 There are several trails running from the various campsites down to the lake shore. This proved useful when we decided to try some fishing. The problem with the lake was that there was a great deal of grass extending from the shore to about 6 feet out in the water… making it extremely difficult to cast a line and effectively pull it back in without getting caught up. 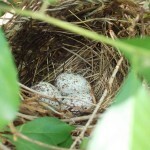 My husband did however find a small nook not too far from our site that was relatively clear. It did have some overhead tree branches, but we were able to navigate around that and drop a few lines. We used worms we bought for $4 from a place called “Shroeders” just 2 miles from the park entrance. 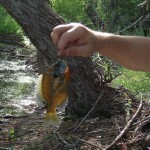 The worms worked perfectly and we caught about 7 medium sized perch. They were fun to catch and the particular area we found to fish in was shaded which was a welcome ch ange to the 109 degree weather. The next morning, Carl (my husband) went back to the same spot and caught 5 more. 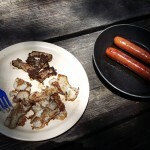 He later filleted them up and we simply pan fried them as a supplement to our lunch of bratwurst. On Saturday, the heat was getting to us, so we decided to take the back road that connects Buescher State Park with Bastrop State Park. I was an 11 mile trip through a mostly scenic route. Unfortunately the wild fires from the previous year have wiped out most of the Bastrop area and it was devestating to see the tall black sticks covering vast areas that used to be full of trees and foliage. 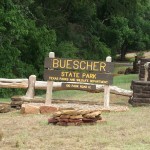 Overall, Buescher State Park is a lovely little campground that is almost unknown by most people. I myself had never really heard of it, until recently. 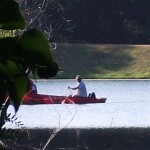 The lake, while not for swimming, is great for fishing and canoeing. 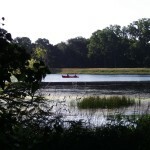 The park rents out canoes and kayaks to those who want to paddle around.